Meyer Aquascapes installs outdoor water garden ponds, water features, water fountains and ponds. When we install a new water garden, we take into a wide variety of factors. Our water feature experts share with us some of their water garden ideas, designs, and the impact these decisions have once the pond has been installed. Many of our customers prefer to go the route of installing their own DIY outdoor water garden pond. If you need help installing your outdoor water garden pond, give us a ring. Here at Meyer Aquascapes we love installing custom water gardens! 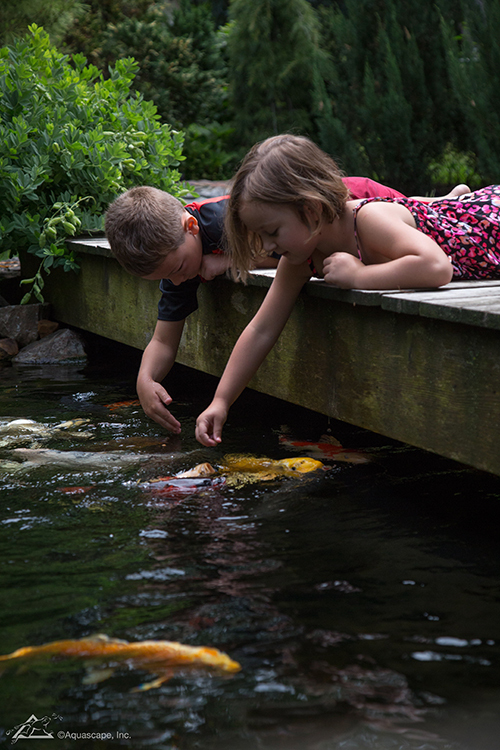 Bringing family together is usually one of the first things people think of when they think of an outdoor water garden pond. Family is a good thing to think about, because everyone will want to see the paradise in your backyard! Water gardens are great conversation starters and breaking the ice with visitors. 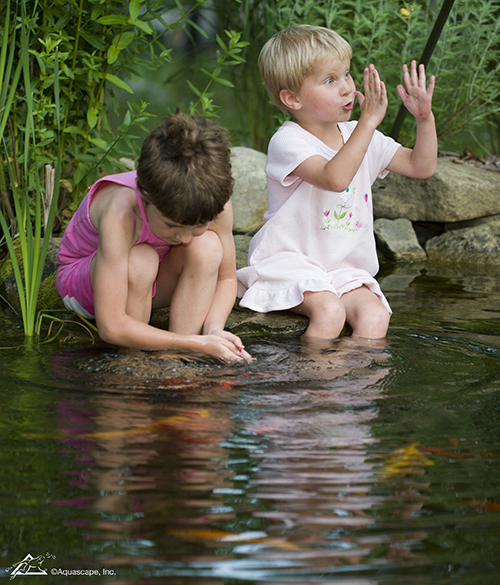 Children love playing in outdoor water garden ponds, and this keeps them out of the mud! 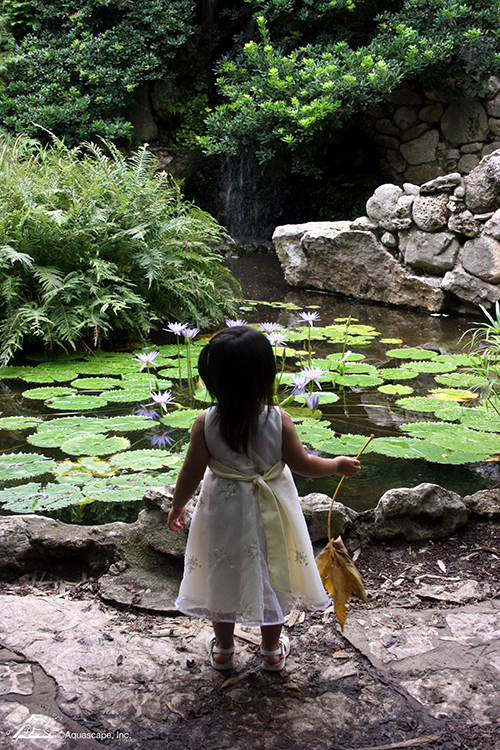 When we design water garden ponds, we think of who is going to be seeing the pond. Are children going to be around? How deep should it be? What kinds of rocks would work best? Why go to the park when your backyard is just as good? 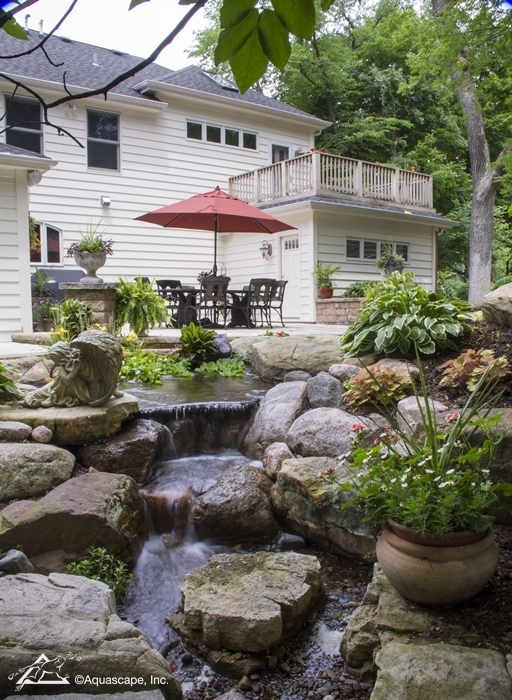 A water garden adds serenity to a backyard, or front yard for that matter! We tried to capture the beauty in this picture, but we just couldn’t. Pictures and words just can’t describe this beautiful outdoor water feature design. Outdoor water garden pond design also includes what kinds of fish we determine to be best for the water garden’s ecosystem. We account for the water garden temperature, climate, tree shade, and proximity to other features. Some outdoor pond fish can be kept together, and some pond fish can be natural predators to other specific water garden fish. Water lilys for outdoor water garden ponds come in a variety of colors, shapes and sizes. 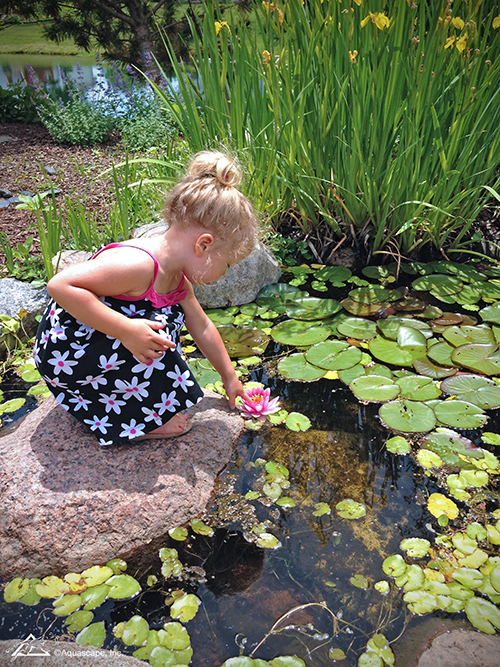 The perfect water lily depends on the water feature, design, and surrounding pond fish. When we design an outdoor water feature pond, we take into account several factors to arrive at a decision on which water lily will thrive in the water garden. Vegetation is important when it comes to outdoor water garden design. When plants are added to a water garden, they assist in balancing the outdoor water garden’s natural ecosystem. Adding in beneficial bacteria helps keep the water clear of gunk and debris. 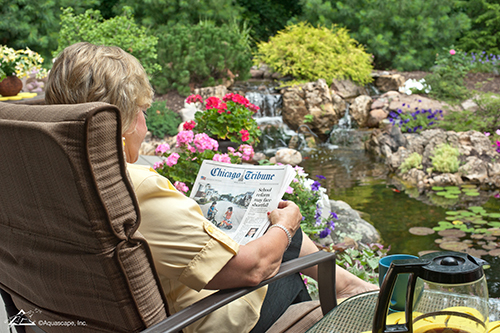 Kicking back and enjoying your water feature is one of the most important things we can help do! When we design an outdoor water garden pond, we think about the placement. 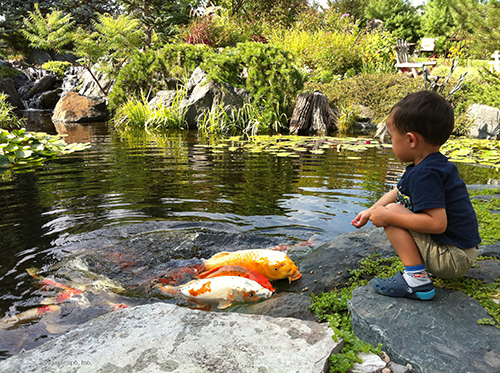 We want you to be able to enjoy your Aquascapes water garden pond as much as possible. 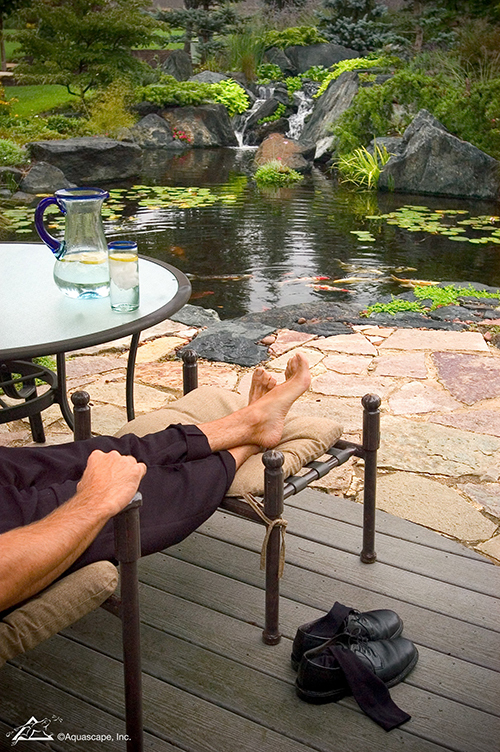 Typically our customers enjoy their water garden pond next to their deck, patio, or porch. Outdoor Water Garden Pond Front or Back Yard? Choosing between the back yard and front yard is one of the most difficult decisions for any outdoor water garden pond installation. When we install a water garden, we help you consider whether you would prefer the front, or back yard. If your water garden is in the front of your home, your visitors will see it right away, but backyard water features are typically easier to enjoy due to the proximity of nearby seating areas.